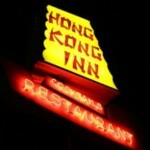 The Hong Kong Inn serves delicious Chinese cuisine as well as some Thai favorites. Try our lunch buffet served 11-3 Daily. Come by during Happy Hour and enjoy live music with Kenny DeVoe, and special priced food and drinks. Join us for Open Mic Comedy on Wednesday nights and for one of our Saturday Night Standup, featuring a comedy headliner.